Housecleaning #1: Blue Bunny sent over a few coupons to get more of their stuff on the blog, and then they sent a few more for the blog's 2 year anniversary. I was more than happy to accept since over the last two years I've really come to aprpeciate the amount of effort that goes into blue bunny treats. This is one of those purchases. 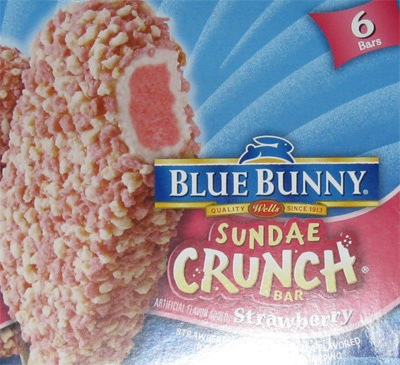 (Sorry for the flash reflection) The Strawberry Sundae Crunch Bar is Strawberry Center in Vanilla Flavored Ice Cream with Crunch Topping. 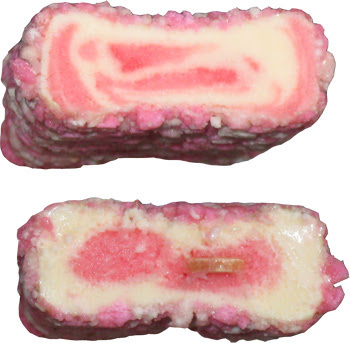 It's similar to the Strawberry Shortcake Bar from Good Humor. It was awhile ago, but I can vaguely remember my first encounter and it just didn't really do a whole lot for me. It's kind of got this weird cheesecake flavor to it (just like the Good Humor bar.... but Good Humor is owned by Unilever, so these shouldn't be the same product). Luckily for me my daughter is a fan so she pretty much ate them all. On Second Scoop: I just opened up the last one to get a few more pictures and I realized something after taking a few bites. That "funk" i was tasting is the unique strawberry sherbet/sorbet-like center filling. It's powerful stuff that pretty much overrides the flavor of everything else. I can't say I'm a fan of these, but I've never really been a fan of ice cream that bites back. Wow, this looks a lot like the good humor one, almost identical.